When Brumbies vice captain David Pocock took out man of the match following his team’s win against the Highlanders last month, the charity he chose to receive a $500 donation was a cause close to a teammate’s heart. David selected Fiji’s Walk On Walk Strong Foundation, which assists children with cancer and other life-threatening illnesses. Fellow teammate and Brumbies winger Henry Speight last year raised $30,000 for the charity by shaving his iconic afro (the end result is pictured above), which until then hadn’t seen a pair of clippers for two years. “Walk On Walk Strong provides support for kids with cancer in Fiji. Donations pay for travel and transport to Suva for treatment, as well as accommodation. “It’s a fantastic cause and there’s a huge need for it. I’m glad my man of the match donation is going there,” David explains. This is the first time David has supported the charity with a direct financial contribution. “When Henry shaved his head last year a bunch of us got our heads shaved too to support both him and Walk On Walk Strong, but it’s all been through Henry’s involvement so far,” he says. Henry, who was born in Fiji and lost his mother to cancer when he was just eight years old, was first touched by the Suva-based Walk On Walk Strong in 2012. He met around 15 kids with cancer while participating in a walk for the foundation in Fiji, but only half are still alive two years later – evidence that more support and assistance is needed. To find out more about Walk On Walk Strong Fiji or to make a donation, visit the website or follow the organisation on Facebook and Twitter. 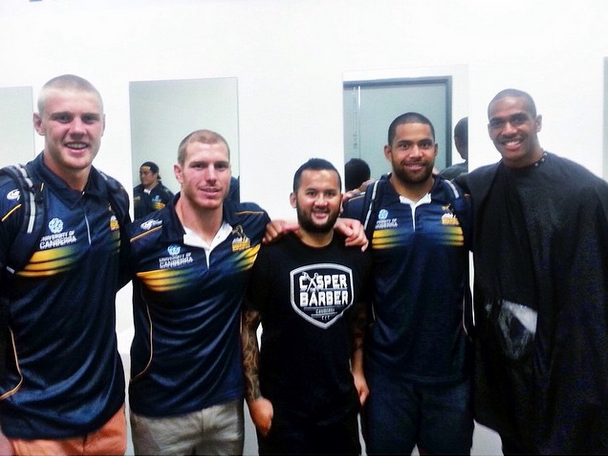 Photo: David Pocock’s Instagram, captioned: “A few of us shaved to support @henry_speight yesterday as he raised $30k for the Walk On Walk Strong Foundation. Privileged to have him as a friend and teammate. It’s the old story: people only want to hear of the drunken exploits of rugby league players and the Raiders have had three of the top contenders in the past few years. Reading about a footballer visiting a hospital is much less hilarious than reading about a raider being pleasured by a dog or an ex raider attempting to clean his face with his own urine. Evidently, some of the Brumbies’ off-field incidents in South Africa have been forgiven and forgotten. How pleasing is it to see footballers making headlines for philanthropic reasons? It probably happens a lot more than the popular press report but then again the majority of footballers (indeed all sports people), who do good work, don’t seek headlines.